View our recreation eGuides or visit JoinOttawa to browse and register for programs offered at Lansdowne Park. Register in-person at a recreation facility or by touch-tone phone by calling 3-1-1. April 13: Three races, plus free family activities! Design an egg car, build it, and compete in The Great Egg Race at Lansdowne Park. All materials are provided. Create an account online or call 613-580-2588 Monday to Friday, from 7 am to 7 pm (except on statutory holidays) and follow the prompts. Outdoor dances in a variety of genres with dance instruction for the public at no charge. Family-friendly performances by local artists will take place in Lansdowne’s beautiful outdoor spaces at no charge to the public. Family-friendly performances by local artists will take place in Marion Dewar Plaza at no charge to the public. Type of performance and description. Thank you to all those who apply. Only individuals and groups selected will be contacted. Here is a glimpse of what you can expect to find throughout the year at the new Lansdowne. Lansdowne Park is a world-class attraction that blends modern amenities, courtyards, heritage buildings and green space. This urban public destination, situated right in the heart of city, offers programming on a year-round basis. It features events and activities for all ages and all seasons. Visitors are welcome to use the park daily from 5 am to 11 pm. Pedestrians and cyclists travelling through Lansdowne Park should practice awareness and caution around heavy vehicles and equipment. Your safety is our priority. This Ottawa landmark, with capacity for 2,800 visitors, will be available for special events and community use. Just north of Aberdeen Pavilion, this courtyard is home to the Ottawa Farmers’ Market. In warmer months, the skating court is converted into basketball courts. During major events at TD Place, the bike corral occupies this space and basketball is unavailable. A colourful, dynamic and fully accessible play space featuring a play structure for children. An exhibit of local floral plants, is the perfect space for family picnics. 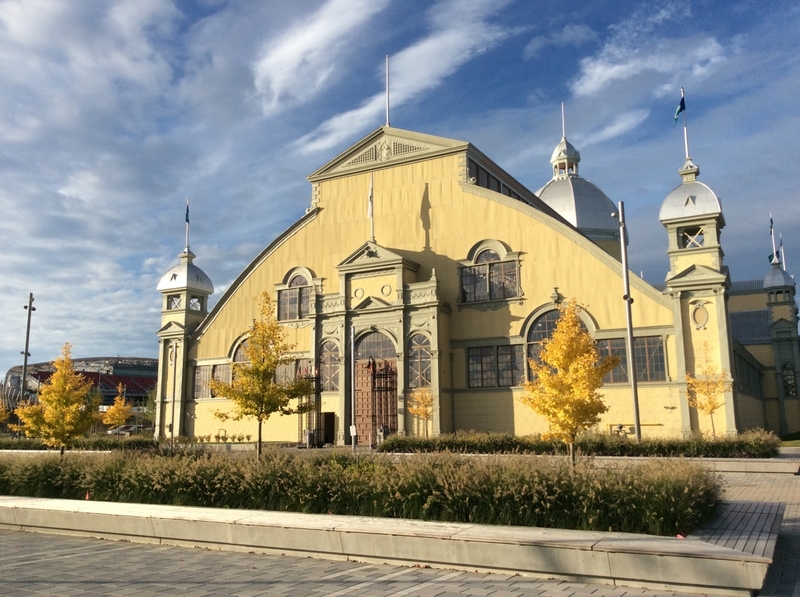 Lansdowne’s history is reflected in this heritage gateway, flanked by Aberdeen Pavilion and the Horticulture Building. The courtyard west of Aberdeen Pavilion, is the main entrance to the park from the Shops at Lansdowne. With a capacity of up to 17,000 people, the Great lawn is a great space for festivals, family picnics, or a game of ultimate. Lansdowne Park features more than 800 trees, including an orchard of heirloom apple trees. Overlooking the great lawn, the Hill features "Moving Surfaces," a sculpture that uses light-emitting diodes (LEDs) to project dynamic video. This heritage building is a revitalized public space for special events and community use. During non-event periods, short-term parking for drop-off/pick-up is permitted along the shuttle loop at the northeast entrance to the park. A series of skateboard ramps ideally suited to beginners. Ottawa’s newest refrigerated outdoor skating rink is featured prominently in the City’s winter programs. South of Aberdeen Pavilion, this square offers seating and space for outdoor performances and festivals. Enjoy the soothing sounds of cascading water from the “Uplift” monument or the 52 dancing water jets that encourage play throughout the summer months. This stunning 24,000 seat stadium is home to the Ottawa Redblacks (Canadian Football League) and the Ottawa Fury FC (North American Soccer League). The arena at TD Place has a capacity of over 9,000 and is home of the Ottawa 67’s (Ontario Hockey League). Both venues can also host concerts and special events. This mixed-use area includes 280 residential units and 360,000 sq. ft of commercial space, including a new 10 screen movie theatre. The Shops at Lansdowne form part of the Glebe Business Improvement Area to find out more about shopping in the area head to their websites. The Element High School is also located at Lansdowne Park. There are lots of options for getting to Lansdowne. On normal days, you can take transit, drive, cycle or walk. For special events, Ottawa Sports and Entertainment Group is providing a range of travel options for you to get to and from TD Stadium. OC Transpo provides regular service to Lansdowne on routes 6 and 7. Enhanced transit service will also be available for major events at TD Place or Lansdowne. An underground parking garage provides spaces for everyday visitors to shop, use the park, and visit the stadium. Spaces are also reserved for office tenants and residents. Please note that only Club Seat ticket holders will have access to parking on game days. The re-developed Lansdowne includes more than 600 bike parking spaces across the site. Secure bike parking will also be provided for major events. The City’s improved network of multi-use pathways and cycle lanes make this healthy travel choice safer and easier than ever. The City has identified a number of routes for cyclists of all levels to get to Lansdowne. All of the pathways leading to Lansdowne are fully accessible, providing everyone the opportunity to enjoy all of the local sites and amenities on your way. To get to games at TD Place, REDBLACKS ticket holders have the option to use a Park & Shuttle service offered by Ottawa Sports and Entertainment Group (OSEG). Event-goers will drive to nearby parking lots and take a free shuttle ride to the stadium. Shuttles will enter Lansdowne from Queen Elizabeth Driveway for the first half of the season. OSEG, the City of Ottawa and the National Capital Commission (NCC) will monitor and assess impacts to the driveway and community and recommend a plan for the rest of the season to establish a long-term plan for reliable transit. Ottawa’s OHL franchise comes home to TD place. CFL football is back in Ottawa! Don't miss Ottawa's professional soccer franchise when they take to the pitch this spring.